The nominations for the 2016 Emmy awards were announced by Gilmore Girls star Lauren Graham and black-ish star Anthony Anderson on Thursday morning. While Graham was much more composed than Lorelai Gilmore would have been , Anderson seemed more of a wildcard, throwing in jokes and reacting with understandable glee when Graham read "Anthony Anderson" as a nomination in the Emmy category for Lead Actor in a Comedy Series. Upon hearing his name called first in the category, Anderson whooped and then gave a shoutout to his mother, saying, "Hi mama, I know you're watching." He then told Graham that she didn't have to read any of the other names (though, obviously, she did). 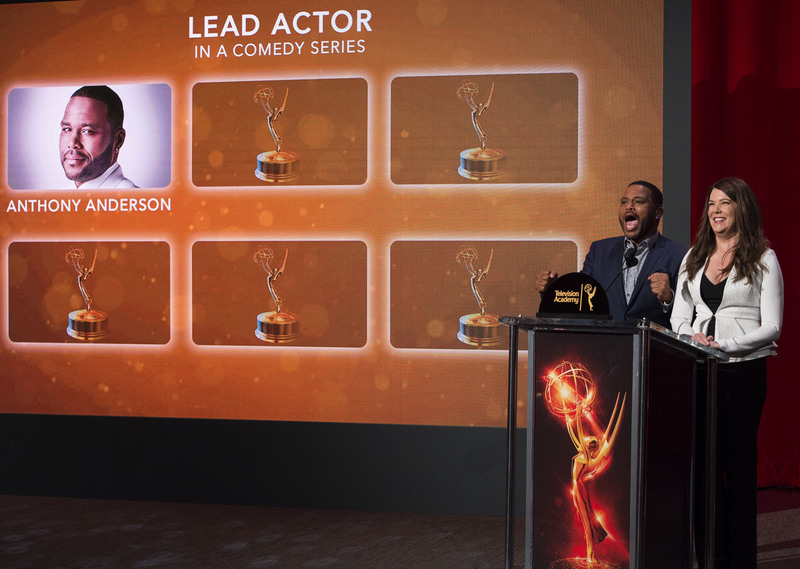 Anderson reacted with similar joy for the other nominations black-ish received, giving a big cheer for co-star Tracee Ellis Ross' Lead Actress in a Comedy Series nomination and startling his co-presenters with his enthusiasm for black-ish's nomination for Best Comedy Series. His joy brought some entertainment and hilarity to an otherwise subdued event. He seemed pretty giddy after all those wins, cracking jokes about his mispronunciation of Downton Abbey (to the amusement of Graham, Television Academy chairman and CEO Bruce Rosenblum, and I hope those watching at home). Then, at the very end of the live broadcast of the nominations, he remembered to make a shoutout to Black-ish creator Kenya Barris. In other words, it was adorable, and also, can Anderson host everything now? You can relive his joy below.